Spent last week out-of-state visiting my sister and brother-in-law. Had a great time! 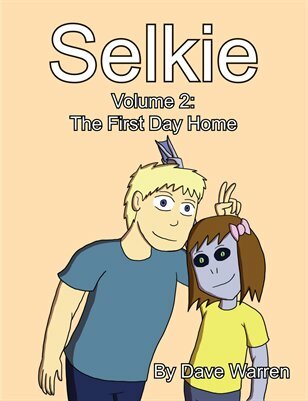 Thanks for putting up with Selkie Lite last week while I was off gallivanting. In other news, Lynni’s timing was not very great, here. For so very long have I been looking forward to drawing Panel 8. And this, Giselle, is why you were suppose to leave the talking to Lynni. But I guess even Lynni ain’t that bright to be saying her plan to Keisha. Nope. Heather needs to get caught and explain everything that happened, especially what Giselle said about why she did it. She has two witnesses she can rely on to back her up, and Giselle might even be persuaded to admit the truth to a teacher since she already admitted it to Heather when she was caught. Oh, and the best part is that thanks to “zero tolerance” and the way it was implemented last time, either Giselle will be punished as well or neither of them will be once Heather’s parents hear what happened. 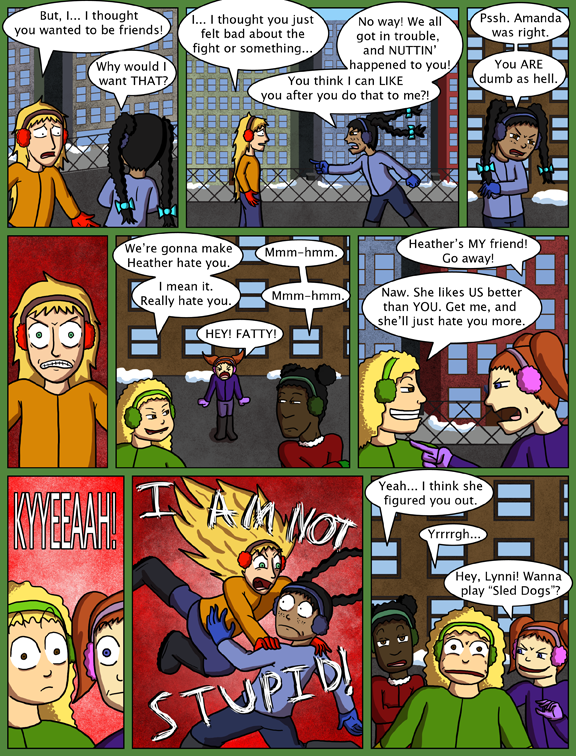 I think Heather is my favorite character in this comic. She reminds me of the time, in 7th grade, this girl was following me and kept poking me, chanting “four eyes, four eyes”… and then I turned and punched her. She never called me Four Eyes again. So, Giselle, you decided that pushing Heather’s buttons about her insecurities about relationships even more was a good thing. This is the girl who took the initiative to steal Selkie’s shirt because she thought it would make Amanda like her more, and you just called her stupid for falling for your manipulative scheme. What did you think was going to happen? All I can say is…GO HEATHER! Sled dogs? I don’t think I’ve heard of that one, and I don’t know if it’s good that I haven’t or not. I haven’t heard of it either, and I count myself blessed in that regard. However, something about the name leads me to believe that involves two children dragging another at high speed throughout the playground. So it’s ok if the ‘good guys’ attack someone. Totally not biased at all. Sure, she was being awful to Heather, but Heather is initiating the first physical hit and and therefor in the wrong. Words are hurtful, yes, but striking someone for it is still wrong. Sometimes people can be so “Politically Correct”, that they lose all common sense; and sometimes a beat-down is best / most expedient way to nip a problem in the bud. 1. She’s a kid – an elementary-schooler. 2. She’s human. Therefore flawed and prone to acting on emotions, like many of us. Dave’s writing her right here, IMHO. 🙂 but it is still true that how she’s reacting isn’t right, and there will probably be consequences for it. Calling it now, BTW: this is the second big incident that she’s gotten into at this school/since being adopted. I predict her parents will either change schools, or say something to the effect of ‘one more/3rd strike and we will change schools’. No one in comic has said that she’s in the right. Just that the manipulation isn’t working anymore. In context it’s a violent outburst done by a child lashing out against her own bullies, it’s not painted as correct or incorrect, just there. Watching it, I personally understand that sometimes in the face of opposition; one must turn to violence to solve an issue. At times that violence can exacerbate the problem, sometimes violence really does solve everything. And yes, sometimes two wrongs do make a right. As for this, I will see what backlash if there is any appears. Heather will be stopped before she does any real damage, and Giselle gets to find out about boundaries and how not to cross them when emotionally abusing others. So it’s win-win all around. I don’t believe anyone is, least of all Dave, claiming this is the right way to solve all problems. It is, however, a pretty realistic portrayal of playground social dynamics and some of the stuff that goes on there. While no, it’s not the mature, rational, and enlightened way to handle these kinds of problems, there are also remarkably few boddhisattvas roaming the playgrounds of our elementary schools. Heck, there are more than a few ‘grown adults’ who wouldn’t handle an analogous situation in an ideal way, whether or not they avoided physical violence in dealing with it. It’s good storytelling. Let’s see where it goes. The complexities of the school playground… I’m afraid I’ve lost track of what’s actually happening. GO HEATHER FAIRWEATHER AND HER +2 EARMUFFS OF DOOM! Seriously, those earmuffs make all the difference in the rage. Who wants cold ears while delivering the beatdown? Not this girl. I shouldn’t be laughing, but all I can think right now is “I know violence isn’t the answer, I got it wrong on purpose”. Hope the teach is too busy with Truck to notice Heather. I asked this in the last comments section so I’m sorry if I’m being a nuisance in asking it again but I’m really curious about the answer. Does Heather have a learning disability or mental disability(I don’t know if I’m using the right terms)? I’m not trying to insult the character, it just seems that she is based on past story lines involving her like stealing Selkie’s shirt and thinking she would be sent back to the orphanage, and in this one, her reaction to being called stupid. This is an interesting view on Heather’s inner workings. As far as the learning disability thing goes, I did not specifically write Heather with a learning disability in mind. I’d say it’s more that she’s very very anxious about being accepted and wanted, and she’s willing to do quite a lot to keep and maintain her friendships. But at the same time, she dislikes being disrespected and will only take so much of it. You speak of Panel 8, Dave, but you should be most proud of Panel 4, I think. Oh dear, sled dogs is like “piggy” isn’t it?